Marketing fads come and go, but a tried and true tactic for driving engagement is a Twitter contest. It’s an easy way to reward brand loyalty and pick up some new followers or leads along the way. Similar to Facebook, Twitter’s low barrier to entry makes it a popular platform on which to hold a contest. But there’s a lot more to launching a successful Twitter contest than just Tweeting out a prize and counting Retweets. There are guidelines to follow, and coming up with fresh contest ideas can sometimes be difficult. Before you start Tweeting about prizes, you need to familiarize yourself with the guidelines. The first key to running a successful Twitter contest is to ensure you’re playing by the rules. Kick off your contest preparation by reading the Guidelines for Promotions on Twitter. You can collect entries by asking people to Tweet an update, follow a particular account or use a specific hashtag. If you’re asking people to use a specific hashtag, it needs to be relevant to their Tweets. Adding your hashtag to a completely unrelated Tweet could result in a violation of the Twitter Rules. You must include a rule that states only one account per individual can be used to enter the contest. Anyone caught using multiple accounts to enter a contest will be ineligible, and run the risk of having all of their accounts suspended. Quality, not quantity should be top of mind. If contestants are asked to repeatedly post near-duplicate Tweets in order to enter your contest, it’s a violation of the Twitter Rules. Doing so could result in users being automatically filtered out of search. Additionally, you run the risk of turning off their followers. Also remember that any contest or sweepstakes you launch must comply with applicable laws and regulations. Ensuring compliance is your responsibility. This is definitely something you’ll want to run past your legal team ahead of time to make sure there aren’t any violations. Every marketing campaign needs clear objectives, especially with contests. There’s potential to garner a lot of engagement here, and that’s not something you want to waste with a spur-of-the-moment contest. Really think about what you’d like to achieve. Increase followers and brand mentions. Each of these objectives can be achieved using one of the contest ideas below. Twitter contests, while certainly valuable for engagement, can double as vehicles for your brand’s story. Consider this example from the textbook rental company, Chegg. Chegg provides discounted textbooks for college students. What better way to promote its budget-friendly service than by asking its customers to show off their savings? To be entered in a daily $250 gift card drawing, students had to post a picture explaining their Chegg savings and use the hashtag #cheggmeout. Chegg let its customers tell their story. This was a brilliant strategy for a few reasons. Anyone viewing these Tweets had a clear message of what Chegg is all about—even if they’ve never heard of it before. It was an easy way to get customer testimonials and increase word-of-mouth marketing across a key demographic. It demonstrated that the service actually works. Other students on Twitter saw Chegg’s money-saving ability in action. Not only do the Tweets and mentions you receive from Twitter contests further your engagement, but they also contribute to your content strategy. You can run a photo contest like Chegg did above, or you can design your contest around photo captions or short stories. Mashable, for example, held a contest (with clear rules) to debut B.J. Novak’s short story collection. Participants had to compose a short story in 140 characters along with the hashtag #mashreads. This was a very creative way to promote the author and his upcoming book. It also got people to engage with Mashable while giving the company extra content to Tweet out. As you receive submissions, you can integrate the best ones into your content queue. This way you’re filling up your content calendar while acknowledging those who engage with you. In its contest announcement, Mashable made it known that it would be Retweeting some of its favorite entries throughout the contest’s duration. Even if your Tweet wasn’t a winner, getting a Retweet from an account with as many followers as Mashable was quite the acknowledgement. Although this Twitter contest didn’t generate as much engagement as Mashable’s, it was still a fun way to engage and geek out with followers. For simply sharing your favorite quote from a movie, participants could win tickets to the planetarium’s Reel Science Film series. The responses might not be retweetable, but the interaction showed off a playful side of the Adler. Maybe you’ve reached a major milestone like your one millionth follower, or perhaps you’ve just celebrated your company’s birthday. Whatever the cause may be, sometimes it’s just fun to reward followers with a giveaway. While this can be as simple as a “Retweet and win” concept, you can get very creative with it like this oldie-but-goodie marketing campaign from JetBlue. In 2009, the brand used the hashtag #JB10NY on Twitter to guide its Manhattan-based followers to different locations where 1,000 free round-trip tickets were available. Participants had to pay attention to JetBlue’s Tweets, which featured location-based clues and instructions on different objects to bring with them. Your giveaway doesn’t have to be as elaborate as JetBlue’s, but it’s worth looking into creative alternatives. It makes it more fun for your followers as well as your team. Plus, if it’s successful, you can turn it into a case study or a memorable campaign that can be shared across your profiles on other platforms. With a very low barrier to entry, it’s easily one of the quickest and simplest ways to enter a contest. With a worthwhile prize at stake, you’ll probably receive a good amount of Retweets and new followers. The down side is that this type of Twitter contest is also very easy to game. Computer engineer Hunter Scott demonstrated in detail how he built a bot to automatically enter contests. As a result, he wound up winning an average of four contests every day for nine months. This type of behavior doesn’t do a thing for your end game. Sure, you might see your numbers spike, but they’re empty. Not only must users Retweet to enter, but they also have to answer a question. Adding an additional requirement other than following your account is a helpful way to weed out bots. You might not see as many Retweets or responses, but at least the ones you do receive will be genuine. Perhaps just as important as the type of contest you run is how you manage that contest. The potential of winning a prize tends to garner a lot of engagement. You need to be sure that you’re ready to deal with the influx of interactions your Twitter account will receive. Fortunately we have tools that’ll help keep you on track. For starters, you can use Message Tagging from Sprout (Advanced plan only) to stay organized and track your Twitter contests by applying a custom tag to any message you send or receive. This helps ensure that your team member in charge of the contest doesn’t miss anything. 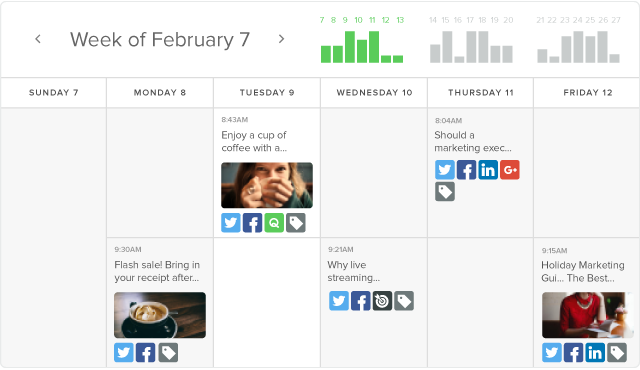 Additionally, volume indicators in Sprout’s publishing calendar, let you quickly spot content gaps so you can find the perfect time of day or day of the week to launch your Twitter contest. Smaller giveaways can be done almost any time, but large-scale contests should stand alone—meaning don’t launch a massive contest the same week you’re running a multi-faceted campaign. Life moves pretty quickly on Twitter and you don’t want your contest Tweets to get lost in the stream. The contest may be finished, but that doesn’t mean you are. You might feel like your team has earned a breather—especially after a complex contest with many moving parts—but a content break is actually the worst thing you could do right now. A successful Twitter contest can result in hundreds or thousands of engaged followers. It’s best to capitalize on the interest and excitement around your brand right away with a strong content strategy following your contest.